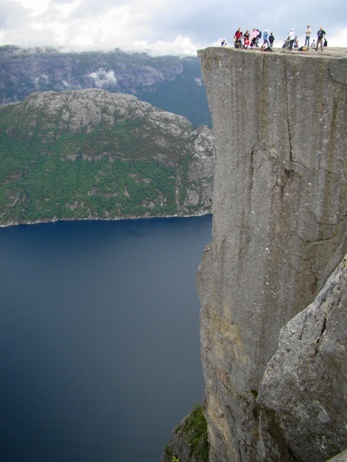 Preikestolen, or the Pulpit Rock, is maybe the most famous nature attraction in Norway. Because of that, it is also ususally a bit overcrowded to be able to fully appreciate the beauty of it. Thankfully, there are some less crowded hikes that you can take around Preikestolshytta, giving you the opportunity to enjoy nature and quiteness. 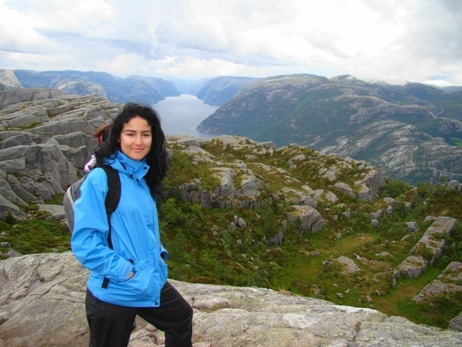 In this post I describe three hikes around Preikestolshytta, including the hike to Preikestolen. 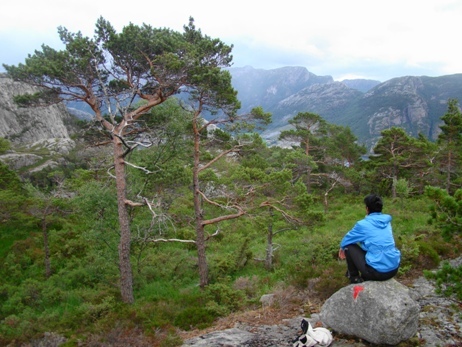 All hikes start from Preikestolshytta, accessible by car or bus (ferry from Stavanger to Tau and some 20 km driving). Refsvatn is the little lake close to Preikestolshytta. 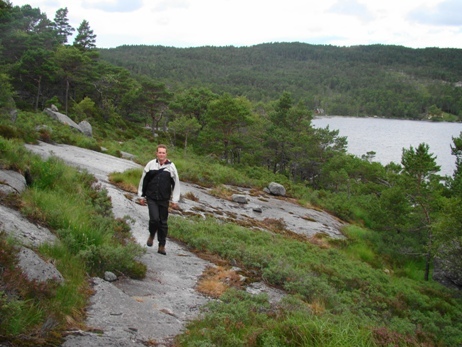 There is a 3-4 hours trail leading around the lake, with quite marginal ascent and different kinds of nature. 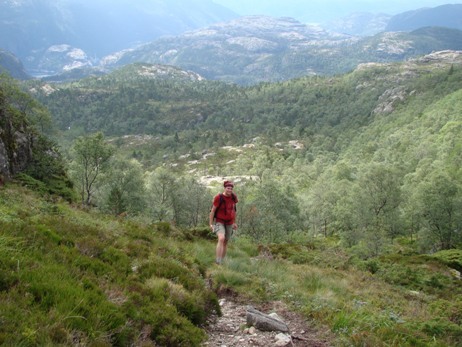 The trail is marked by Turistføreningen with the red T-marks, and the only challenge is that it can be quite muddy in wet weather. 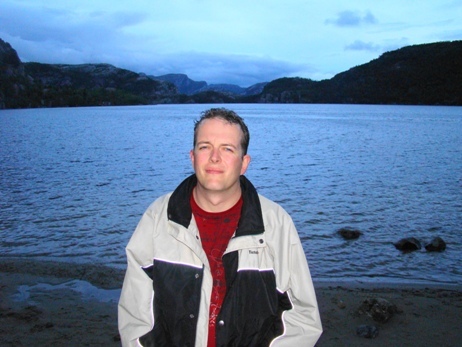 We went around the lake counter-clockwise, but walking the other direction is just as good. 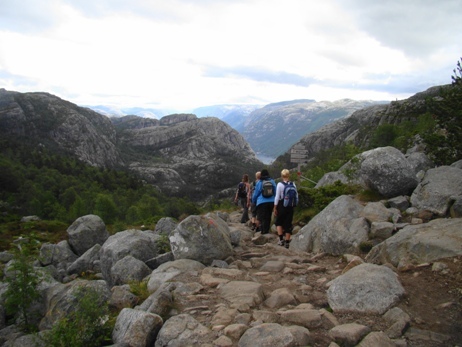 During the hike we didn’t meet anyone, quite a contrast to the busy Preikestolen. 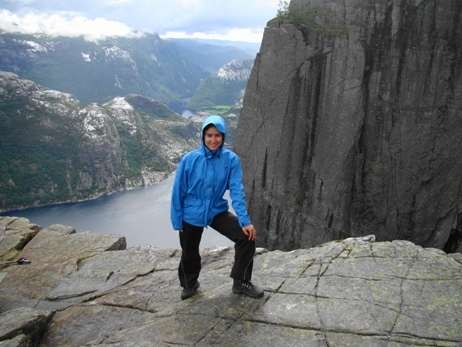 Preikestolen is a special rock formation some 600 meters above Lysefjorden. 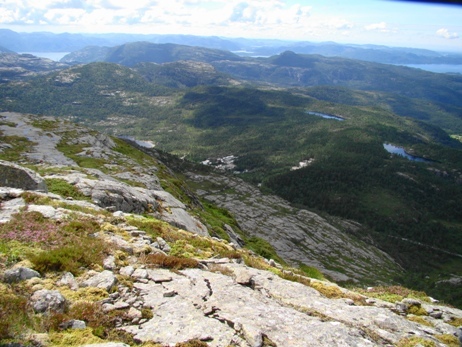 The view down to the fjord is fantastic, and the hike up is not that challenging, but requires a reasonable physique. 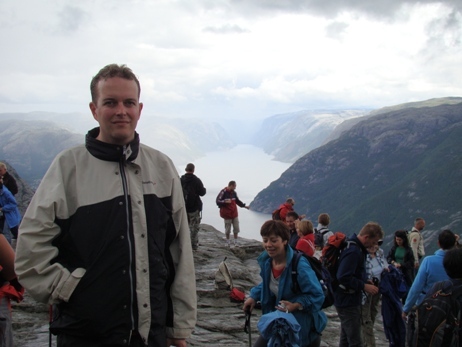 To get up to Preikestolen takes around 2 hours, so it is wise to reserve around five hours to get up, enjoy the view and back again. It is difficult to go much faster, since the route is crowded by a long line of tourists, with queues everywhere someone is slow. It is not always possible to pass others, so sometimes you just have to wait. 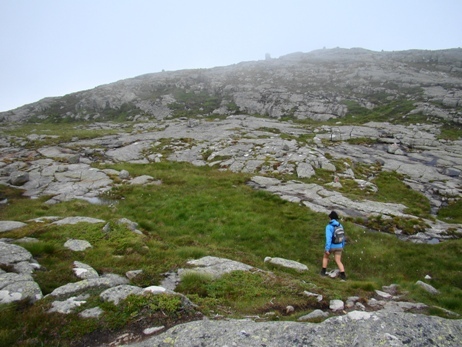 This hike has some steep ascents, and can be slippery after rain. Quite many tourists had walking sticks with them, and they mainly slowed them down. Walking sticks are great on even terrain, but here you only lose the free hand that you can use to grab support with. It is definately adviseable to start early or late for this hike, so that you avoid the worst rush and can enjoy the view without hundreds of people running around taking pictures. 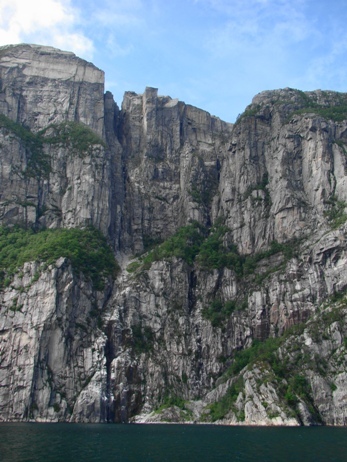 There is an alternate route down from Preikestolen, that involves climbing a bit higher. 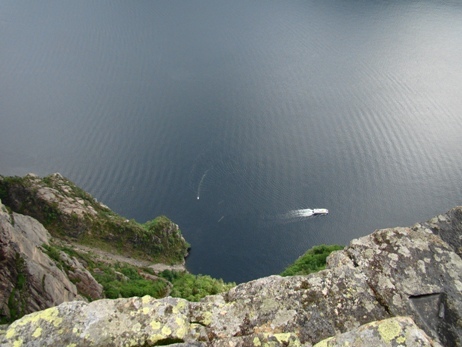 We didn’t try it due to the wet conditions, but it probably gives a really great view of Preikestolen from above. Moslifjell is a 718 meter high mountain close to Preikestolshytta. 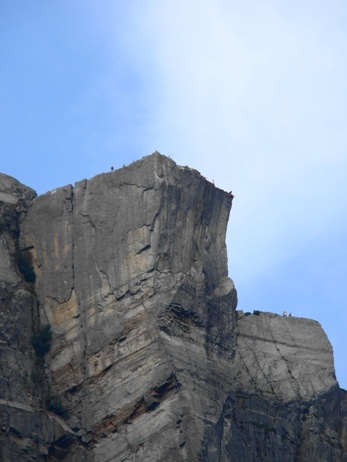 The ascent is about 450 meters, but in dry conditions there aren’t any bigger obstacles. 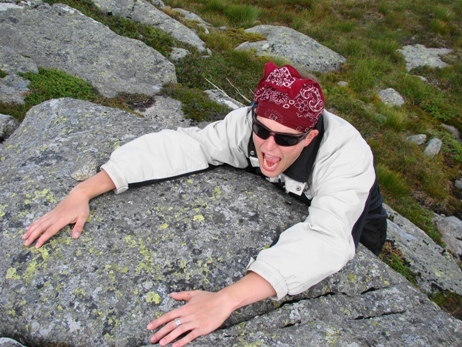 You only need to use your hands at a few places during the climb. The hike takes about 3-4 hours. 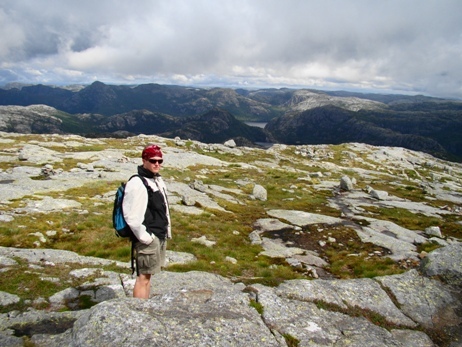 This was our favourite hike from Preikestolshytta, with beautiful views towards Stavanger, Forsand, Preikestolshytta and other surroundings. 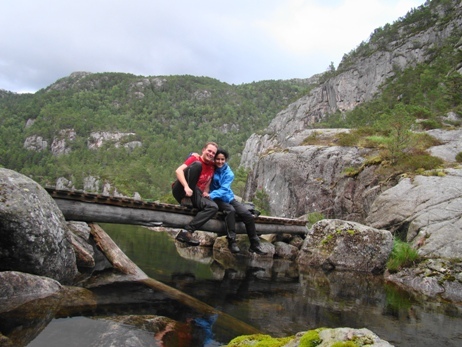 During the hike we only met one other couple after the first kilometer that is shared with people going to Preikestolen. 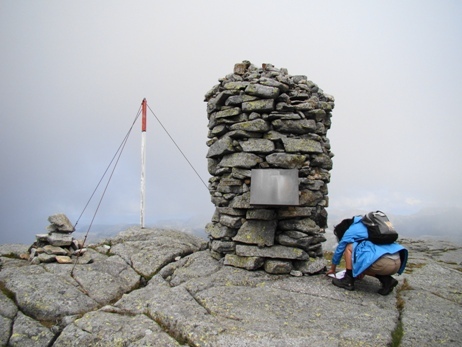 There is a sign at Koggabekkmyra that shows the start of the trail, and after that you only follow the red T-signs. There is an alternate way down that we used, avoiding having to walk the same route back. Vilka snygga bilder från Norge! Visst är det underbart att fjällvandra. 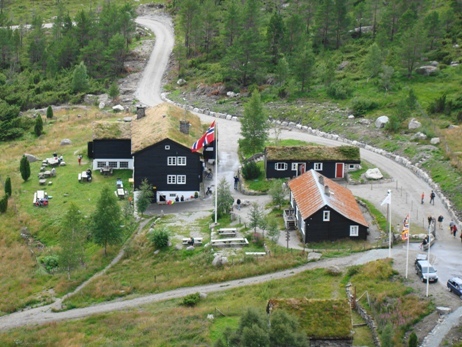 Vi var i Venabygd i fjol, i år blev det beskedligare men ändå trevliga vandringar i Sälenfjällen. Tack! Jo, fjällvandring är fantastiskt. Särskilt då man lyckas ta sig någonstans där inte andra människor syns till (tycker åtminstone en stadsbo).